Four years ago, when a group of girls asked me to direct a school performance of The Wizard of Oz, none of us knew how much work it would really take. We learned that just one construction site flood light makes for some spooky Halloween-type shadows, but not great lighting for a performance. We also figured out that PVC pipe and cardboard, while cheap and useful, are not the sturdiest materials to build set pieces. Additionally, we learned how just showing up for rehearsals every day doesn’t mean you’re prepared for show night — you’ve gotta memorize those lines! However, despite obstacles and “learning experiences,” Show Night made it all come together, and as we presented our hard work in front of our families and friends, Rainier Prep’s Drama program had begun! Years 2 and 3 took the “good” and made it better. Alice in Wonderland saw our first designated student Stage Crew along with an adult Technical Director leading the charge on all things tech so that the Cast and I could focus on rehearsing our scenes. Peter Pan followed with so much student interest that we could actually hold auditions. 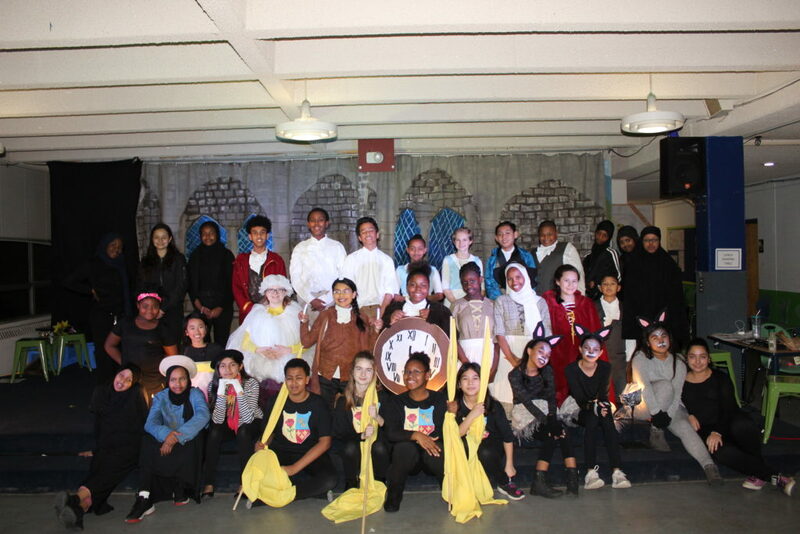 We finally hit our stride with Peter Pan by increasing student ownership of the play from start to finish. We created a quarter-long tech theatre enrichment for students to learn about sound design and building sound cues. Students researched and re-wrote the script to make scenes more culturally sensitive and authentic. Finally, the students designed and painted all our set pieces — this time from wood! I am immensely proud of all the hard work our students put into the play every year, leading to this year’s Beauty and the Beast as our best one yet. Through unwavering support from our Rainier Prep community, and through donations from Ed Hoffman and the Seattle Academy Arts Department, we had some incredibly detailed sets and props. Students and families volunteered their time for multiple work parties to make three full-size, hand-painted backdrops. Additional school funding enabled us to rent microphones so the audience could actually HEAR the performers, and to purchase/construct costumes that looked straight out of 19th century France. Our Drama program has grown so much in the past four years that I’m honestly a little worried about how we’re going to top ourselves next year — but with the enthusiasm our students have for theatre, and with the support of the Rainier Prep community, I’m sure it will be the next “best one yet”!